There’s an episode of The Simpsons in which Ringo Starr answers a piece of fan mail from Marge, decades after she wrote to him. So by the standard of a Beatle, Packers quarterback Aaron Rodgers is pretty quick in responding to his fan mail. 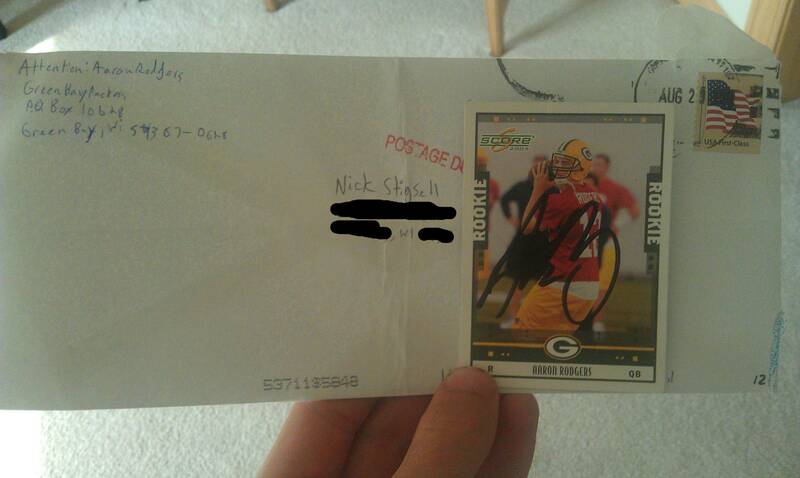 Still, when 15-year-old fan Nick Stigsell got a Rodgers autograph in the mail last week, it had been so long since he asked for it that he had forgotten he ever made the request. When the self-addressed envelope with Stigsell’s name on it, containing a signed Rodgers rookie card, finally arrived, it took Stigsell a moment to remember that when he was 10, he had mailed the card to the Packers’ headquarters with a request that Rodgers sign it and send it back to him. Stigsell told Michele Steele of ESPN that in 2007 he thought that Rodgers, who was Brett Favre’s backup, would get fewer autograph requests and therefore be more likely to respond. Stigsell said he plans to hold on to the card — unless some sports memorabilia collector blows him away with an offer. “I don’t think I’m going to sell it unless I’m going to get a lot of money for it, like if it could pay for college,” he said. An autographed card paying for college is probably too much to ask for, but it is a cool memento for a Packers fan. But the Packers caution other fans that if you want a player’s autograph, you’re a lot more likely to get it by attending training camp or a fan convention. Most fans who send a card in the mail won’t get an autograph back, even if they’re willing to wait five years. Wouldn’t the stamp not be enough anymore? Pretty cool story. Kid should keep it; the money he gets for it now would be pennies compared to what he will most likely be able to get for it years from now. He’s also 15 and there’s a greater likelihood that he would squander the proceeds on something. Regardless, good for him. It could have been a forever stamp. Otherwise who pays for the stamp, Rodgers or the team, and what are the rules of that? I just want to make sure that Aaron Rodgers isn’t receiving any off the books money in violation of salary cap rules. Hmmmm ….. degree from UW? Or an autographed rookie card? Kind of a toss-up when you really think about it. My advise to the youngster would be to sell the card and use the money to buy a box of trojans. That’s funny. Was at his draft with a huge Packers fan. Waited til the end and he was rooting for Rodgers to GB the whole time. Rodgers kind of snubbed him for an autograph after his sit down interview following being drafting. We understood at the time because of the garbage situation he was in but it would have really made for a special day for my buddy if Rodgers would have acknowledged him. Alex Smith should send an autographed jersey to Rodgers. I used to send cards in the mail just like that with a little letter to many MLB baseball players when I was 10-12 yrs old, the only 1 I got back was from Charles Nagy of the Indians about a year later. I still have it doubt its worth as much as ARodg. Wonder if Rodgers’ moustache would autograph his ESPN the magazine cover photo? I used to do the same thing back in the day, mostly hockey players and a few baseball players. Didn’t get anything signed back from ball players but Barry Bonds and Mike Piazza’s people sent cards and stickers back. I got all the hockey players back with the card signed including Wayne Gretzky, Steve Yzerman, Pavel Bure, Ed Belfour. Belfour must have put everyone that sent him mail on a list because I recieved Christmas cards (mass printed ones with a letter from him inside) from him for years after that, pretty cool. cards aren’t worth crap. I found a box with a ton of cards from the 60’s and 70’s in mint condition, it has two OJ Simpson rookie cards in it, I couldn’t even buy lunch at olive garden with what I was offered. Autographs are plummeting in value. You probably couldn’t get more than $50 for that card… and I’d say $20 is a fair price. Farve would have sent him back a text of Lil’ Brett. It’s sad that players won’t sign and return cards anymore. Around the time of Super Bowl XXXI my sent cards of Packer players with a hand written letter asking for the player’s autograph to add to his Packer collection and a SASE. All the players he wrote to signed their card & sent it back to CJ with the exception of Reggie White. His press agent sent back the card unsigned with a letter explaining that Reggie was receiving approximately 5000 pieces of mail a week & couldn’t respond to every one. Several players personalized the card. My son had a blast for several years waiting for the mail to arrive. Where had the card been for five years? It’ll take less than 5 more years for the kid to see the inherent folly in autographs. Hopefully. Wow, even when Rodgers was a backup he thought he was too good to give an autograph to a kid. I cringe every time I see some fool groveling for a worthless autograph…If this card has some intrinsic value, having it signed would bump it up but were talking probably less than $100 maybe way less, autographs are just a waste of time unless the object itself is already of value. I sent Eric Metcalf of the Cleveland Browns a SASE and his card to get signed back in 1988 when I was 15. I completely forgot about it until my mom called me in 2003 and said I had some mail at her house. Low and behold it was my SASE with and extra 10 cent stamp on it to make up the postage and the post mark was from Seattle Washington. Inside was my signed card.